Aside from robotic vacuum pool cleaners, one of the most used automatic cleaners is the pressure side pool cleaner. Basically, these side cleaners are attached to the pressure side (also known as the return side) of your pool's circulation system. Pressure side cleaners are the ones to choose if you would want a pool vacuum that does not only clean the pool but also helps in distributing filtered clean water around the pool. The Polaris Vac-Sweep 380 pool cleaner does just all of these - only better. Check out on why the Polaris 380 is on the top of the list of pressure side pool cleaners you should invest in. Polaris, the makers of this device, claims that the Polaris 380 to be the "most powerful and durable pressure pool cleaner." How is this so? It's powered by not just one or two pressure jets -- but three. It operates on three jets and a separate booster pump so it could function thrice as powerful as any pressure cleaners out there. It is designed for in-ground pools with any type of surfaces. Name it and this device could surely clean it. 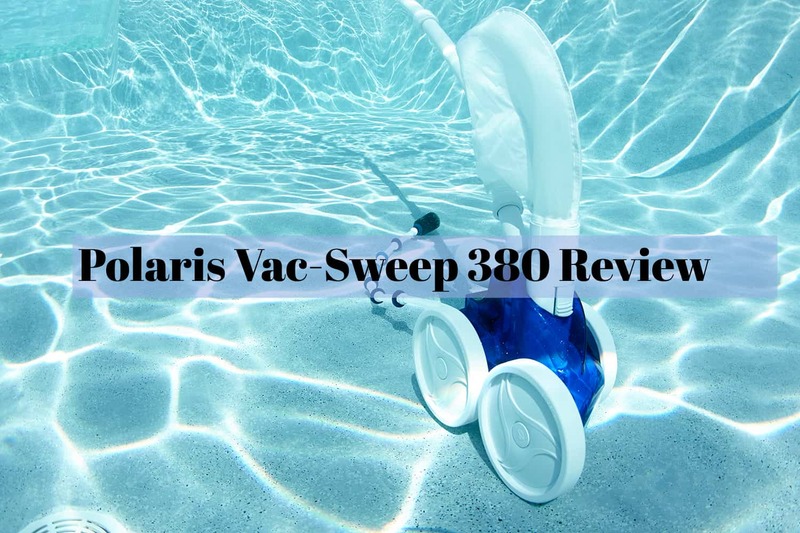 Since it is powered by triple jets, the Polaris 380 sweeps, scrubs, and vacuums every square inch of your pool. From the floors of the pool to its walls and steps - there's nothing this pool cleaner couldn't miss. It also features an all-wheel belt-driven mechanism which provides greater vacuum power. With this massive amount of vacuum power, the Polaris 380 can clean the totality of your pool's surfaces in just three hours or even less. That's how powerful this just is! Aside from those, this is equipped with a single chamber filter bag which holds debris securely until it's time for it to be cleaned out. It removes debris before it reaches your pool's pump basket or filter which can prolong the life of your filtration system. The single chamber filter bag is actually pretty roomy and could handle a large amount of debris before it needs to be cleaned once again. Unlike any other side pool pressure cleaners, this product comes with an efficient back-up valve. Back-up valves are essential because these are additional equipment which can free the cleaner when it's stuck in tight and hard-to-reach corners. It works by reversing the machine every three minutes so it can clean the whole area of the pool and not just in a specific area. The Polaris 380 is also available in a Black Max model to complement pool with dark floorings. Q. What is the difference between the Polaris 280 and 380? Ans : The Polaris 280 has only two jet nozzles and the mechanism is driven by gears while the Polaris 380 has three jet nozzles and it is belt driven. When it comes to durability and strength, the Polaris 380 outweighs the 280. Q. Can I buy an extra hose or a longer feed hose for this pool cleaner? Ans : Yes! You can definitely buy an extra hose and additional components for the Polaris 380. Aside from the hose, you can buy different kinds of debris and filter bags and tires. Q. My current pool cleaner constantly gets stuck or trapped against the steps, will this happen with the Polaris 380? Ans : No, it will not. The in-line back-up valve ensures that this does not happen. It automatically frees the device if it gets cornered or encounters an obstacle along the way and cleans without interruption. Q. Will this work with a low-speed motor or does it have to run with high-speed ones? Ans : The overall cleaning performance of the 360 will be determined by the number of gallons it puts out per minute (GPM). It can also work with a total dynamic head. So in this case, the Polaris 360 will work on either low speed or high-speed motor. Q. Will this work if I simply unscrew one of the return jets in my pool and screw in an adapter? Ans : There is usually a dedicated return line for the cleaners and it is usually located in the geometric center of the pool. It's the one equipped with a filter, runs at a certain pressure, and has its own shut off valve. 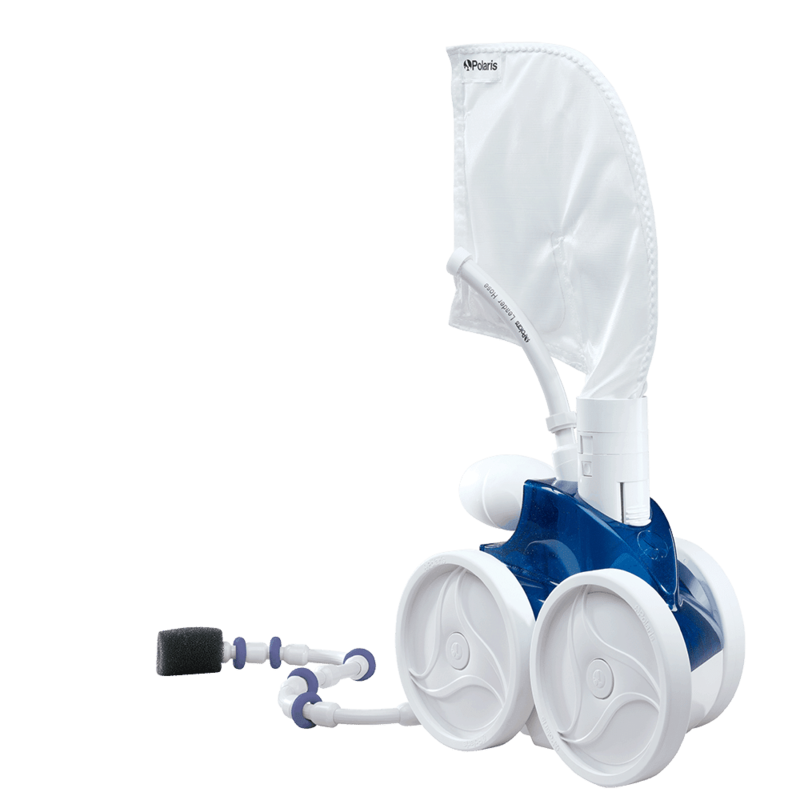 The Polaris 380 is truly a powerful and durable pressure side pool cleaner. The fact that it is powered by triple jets is enough to prove that this might just be Polaris' best most powerful cleaner. It's also great for all types of in-ground pools as it can clean out any kind of pool surfaces. Its durability can far be overstretched with the all-wheel belt drive mechanism. It can also guarantee the longer lifespan of your pool's filtration system since this pool cleaner ensures even up until to the smallest debris. Although you will need to purchase a booster pump for this to work, it will only require some of your time and effort during the installation phase. After that, your side pressure cleaner is good to go. So, if you're looking for a hassle-free pool cleaner with the lowest possible maintenance needed, then the Polaris 380 is for you.